Mexico is a country rich in culture and traditions. The old Mayan civilization left an important legacy materialized in numerous temples and archaeological centers distributed throughout the country. One of the best known is Chichén Itzá, declared one of the Seven Wonders of the Modern World, as well as Tulum, whose famed image of The Castle facing the Caribbean Sea is one of the most recognized in the country. Both the Mayan Riviera and Yucatan have some of the most paradisiacal beaches and both regions are ideal for water sports such as snorkeling, scuba diving or paddle surfing to enjoy the marine biodiversity. Among the most common species found in Mexico are dolphins and whale sharks. The capital, Mexico City, is the commercial center and one of the most important intercultural areas of the country. Here you can enjoy ancient traditions such as Xochimilco, as well as modern buildings and a lively atmosphere both day and night. Its colonial towns such as San Cristóbal de las Casas or Mérida are other attractions in the country and the best places to discover the rich Spanish heritage mixed with the traditions of the native population. 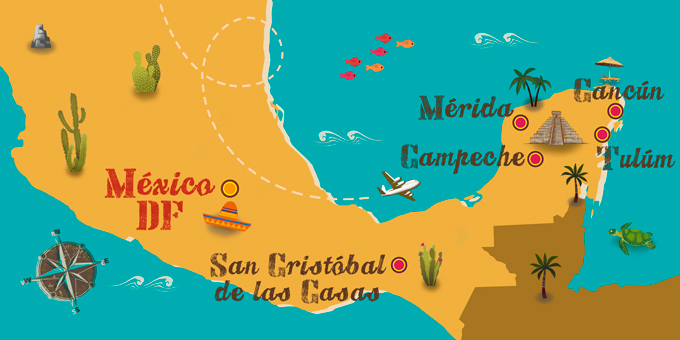 A vacation package to Mexico will be accompanied by one of the most delicious cuisines in the world, in addition to the popular music of the mariachis.